NASCAR’s youth movement might end up going much deeper than its fresh crop of baby-faced drivers. On Jan. 30th, NASCAR announced that longtime employee Jim Cassidy had been repositioned into a new Chief International Officer slot, designed to grow the company’s international fan base. The eyebrow-raiser, however, came several paragraphs later when it was revealed that Ben Kennedy had been put on the company payroll to become General Manager of the Camping World Truck Series and work alongside current series Managing Director Brad Moran. The 26-year-old Kennedy elected to hang up his helmet and walk away from a racing career, highlighted by a victory in the NASCAR Truck Series at Bristol, Tenn. in Aug. 2016. On the surface, the announcement was another in a series of participants in racing hanging up their helmet or wrench and sliding into a NASCAR management role (i.e. Brett Bodine, Elton Sawyer, Robin Pemberton, Scott Miller, Gary Nelson, etc.). However, the Kennedy hiring goes much deeper than NASCAR merely dipping into the competition pool to make its next hire. The Kennedy hiring is curious, when you consider that his great-grandfather is the late Bill France Sr., the founder of NASCAR. He is the son of Lesa France Kennedy, the CEO of International Speedway Corporation and a member of NASCAR’s board of directors. In an era that has witnessed the departure of the likes of Dale Earnhardt Jr., Jeff Gordon, Tony Stewart and Matt Kenseth and the emergence of future on-track stars such as Kyle Larson, Ryan Blaney, Chase Elliott and Erik Jones, could Kennedy be set to follow in their footsteps in the top dog managerial role? Whispers of Kennedy being groomed to replace Brian France, his uncle and the 55-year-old CEO and Chairman of NASCAR, have circulated throughout the garage for the past several seasons. Brian France ascended to the top of the managerial pecking order at NASCAR in 2003, amidst the failing health of his father, Bill France Jr. While “Big Bill” France Sr. is credited with laying the foundation of the business in the 1950s and 1960s, France Jr. will forever be remembered for taking the sport to new heights during the 1980s and 1990s as popularity soared and big money flowed into NASCAR. Once recognized as one of the most precious sports commodities in the nation, NASCAR has seen its attendance and TV ratings falls severely during the past decade under Brian France’s watch. The days of lucrative sponsorship deals up-and-down pit road have dwindled to a precious few. Driver memorabilia revenue is down sharply from the glory days of the 1990s and early 2000s. Former NASCAR Cup champion Brad Keselowski, when asked recently about the economic climate of racing, acknowledged that he’s not sitting in first class nowadays and is just happy to be onboard the plane. France has been criticized by several prominent drivers, including Keselowski, for rarely attending races. He’s also butted heads throughout the years with drivers such as Denny Hamlin and Ryan Newman, who were admonished by France for comments he felt were detrimental to the sport. Can blame for the decline in the interest of NASCAR be laid squarely at the feet of its current CEO? That’s up for debate and continues to be discussed. 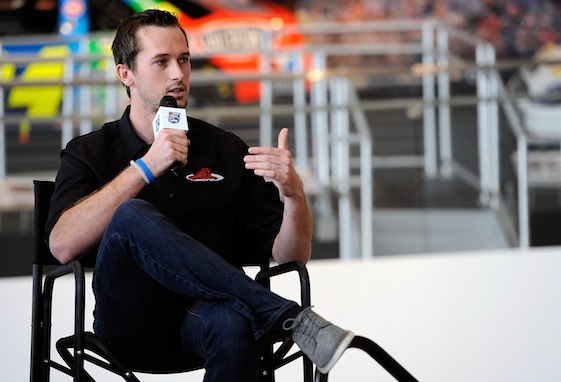 But given NASCAR’s sudden shift in promoting the sports’ new guard of drivers to attract a younger demographic fan base, don’t be surprised if a twenty-something kid named Kennedy follows suit and is given the keys to the NASCAR kingdom sooner rather than later. How refreshing it would be to have someone in charge that actually loves the sport and sees it as something more than a way to put $ in his own pocket.